If there is such a thing as a garden panacea, it is compost. Compost improves all the elements of soil from texture to water retention to nutrient content and availability to plants. In essence, composting is simply the process by which we replicate nature’s activity in a healthy ecosystem, the kind of system on which the pants we use for food and aesthetics depend. It is what nature already does to replenish the life of the soil, thereby keeping plants alive. As leaves, twigs and other plant matter drop to the surface each year and combine with dead insects and animals, moisture and microorganisms work to break down that matter back into the substances needed for the continuous cycling of healthy plant growth. This substance is called humus. By recycling the matter in our own gardens and kitchens in a controlled environment, we can accelerate the development of humus in the form of compost, contributing more than any other single factor to the fundamental health of our gardens. It’s like providing our gardens with a healthy diet – the more we provide over time, the less we will need synthetic interventions that can have harmful side effects. 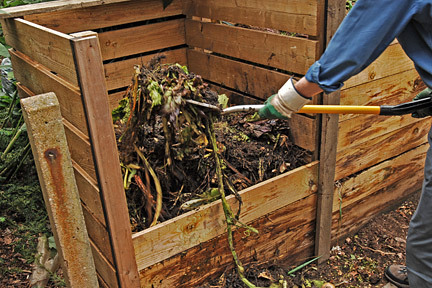 With the right combination of moisture, brown and green materials, and a little knowledge and effort to help the process along, we can all create compost to improve the health of our gardens and the planet. A compost demo area and more in-depth information will be available at Garden #2.